La Serenissima sends her siren call to lovers of water, art, and architecture. Explore the city’s landmarks, or lose yourself in the narrow pedestrian lanes and side canals that connect its most beautiful smaller churches and neighborhood squares. Tour the city’s palaces and museums, or hop a boat to the islands or the beach. Stay in a charming neighborhood apartment. Sights to see: Piazza San Marco, Rialto Bridge, the Accademia, Ca D'Oro, Palazzo Ducale, Murano & Burano islands, plus easy day trips by train! Day trips and Sightseeing: There are so many magnificent things to see in Venice: In Cannaregio, the north side of Venice: Madonna dei Miracoli and Madonna dell’Orto (Renaissance painter Tintoretto’s church). In the districts of San Polo and Santa Croce: the Scuola Grande di San Rocco, the Rialto Bridge and market. In the Dorsoduro, the East Bank of the Grand Canal: the Accademia and Guggenheim museums and Ca’ Ressonico (a canal-side palace with all the aristocratic accoutrements). In San Marco: the Piazza San Marco and its Basilica, the Palazzo Ducale and Couture Alley. In the Castello district: the Arsenale, the historic shipbuilding center of the city. 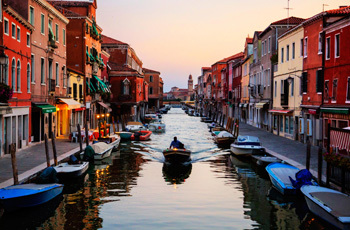 On the lagoon islands: Murano, world-famous for its glass; car-free Burano for colorfully painted houses and exquisite lace; Torcello for sylvan quiet and the renowned Grand Canal. Farther away by rail are Padova, Vicenza, Treviso and Verona. One or two weeks in a personally selected private apartment in the heart of Venice. Transfer from the Venice airport or rail station to your new Untours home (set arrival times only), and transport back to the airport or rail station on your departure. A 7 or 14-day Vaporetto pass, good for unlimited rides on the water buses that ply Venice’s canals. A walk around town and orientation with our on-site staff person, to give you insider tips and start your trip on the right foot. Local information, plus our own Untouring Venice guidebook, researched and written by Untours staff, full of the best restaurants, sightseeing, and other suggestions. A local cultural activity, like a gondola workshop visit and lunch.